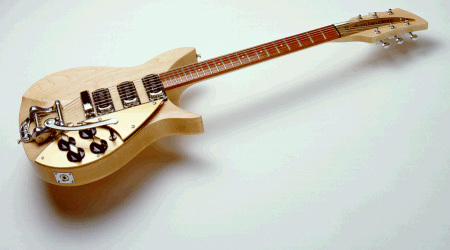 Rickenbacker named best maker of reissue guitars. In the September 21, 1990 issue of BAM magazine, in an article by Norman Harris, Rickenbacker won the singular distinction of being the manufacturer of the best vintage reissue guitar of all the popular brands surveyed. On a scale of one to ten, Rickenbacker rated the highest score of all, a nine. This score was based upon the Rickenbacker reissues coming closest to being exact copies of the originals. RIC prides itself on its commitment to authenticity and its dedication to quality. Of course we also offer the added assurance that every reissue guitar we make comes forth out of our factory in Santa Ana, California, where quality control is of prime importance, and we don't have to call long distance in order to be sure of that fact.